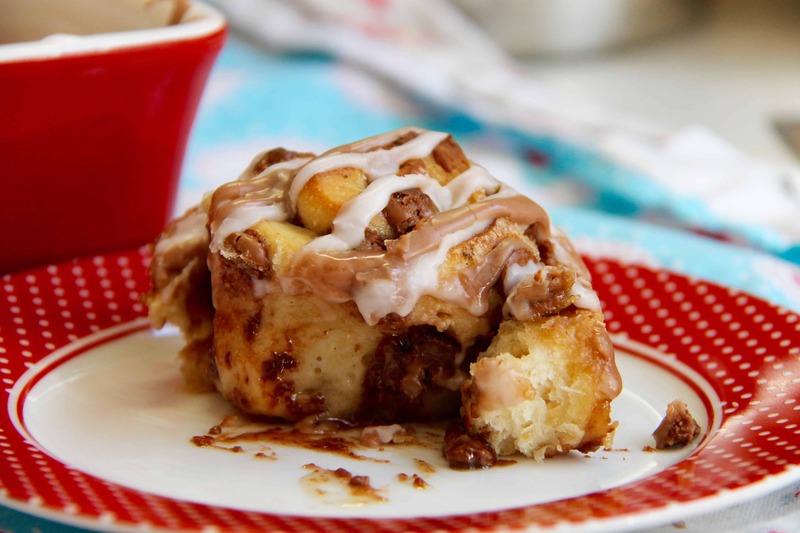 Deliciously Sweet, Sticky & Chocolatey Sweet Rolls – Just like you get in a bakery! A few weeks ago I posted the recipe of my Lemon & Blueberry Sweet Rolls – and they were a massive hit, with so many people baking them and sending me the photos (THANK YOU! I love seeing the bakes of my recipes!) I also mentioned in that recipe that I wanted to share my Chocolate Sweet Rolls, so huzzah here they are! My boyfriend is obsessed with these – he says “They taste like sweet buns mixed with iced doughnuts, and so much chocolate!” Which is a good thing, apparently 😉 But seriously, these rolls are full of a deliciously sticky vanilla sugar and chocolate chips, with a sweet bread recipe binding all the goodness together. They’re SO moreish! This recipe makes 12 delicious buns! – 275ml Milk, I use full fat but you can easily use semi skimmed! 4) Whilst the bread is proving you can make the vanilla sugar – mix the caster sugar, brown sugar, and vanilla pod seeds until a sand like texture is formed. Leave to the side. 7) Cover again and leave to rise for 1 hour – towards the end of the hour heat the oven to 180C – Once the hour is up, bake in the oven for 20-25 minutes until golden brown on top and cooked through! Leave to cool. 8) Once cooled, mix the icing sugar with the water, split into two bowls and mix half with a touch of cocoa powder – drizzle onto the sweet rolls and enjoy! This recipe is inspired by many different I have tried and read over time, I’ve been baking these for a few years now so they have been tried and tested many a time! These are best eaten on the day of baking, but they will last covered for a few days days! P.s. These are the perfect chocolatey sweet breakfast treats, if you can wait for the bread to prove! Find my other Bread/Breakfast recipes on my Recipes Page! Older Next post: Biscoff Cookie Butter Cupcakes! Newer Previous post: Nutella Fudge! I am from the USA, we do not call flour “strong bread flour”. is this white All Purpose flour? I am not sure which I should buy? Strong white bread flour, is a type of bread flour. Use your best alternative for a standard bread loaf – not cake flour/plain. Hi, Jane. These look so delicious and I’m hoping to make them for a girlie weekend away. Do you use the fast action dried yeast? Thanks. Hi Jane, I’m looking forward to trying these but 14g of dried yeast sounds a lot . Is that the correct amount? These look amazing. Im going to try them without the lemon as family members get ill from it. Will this affect the bake or just the flavour? Work love your bakes when ive made and family too. Thanks for the awesome recipes ? It would be fine without! ? oh they looks so so yum!! Thank you! I usually take them to work, or my family does, or anywhere really! Sometimes someone is asking my to bake them so I put up the recipe as I’ve made it haha 🙂 I do want to eat it all myself however!